My favourite feet for bag making! 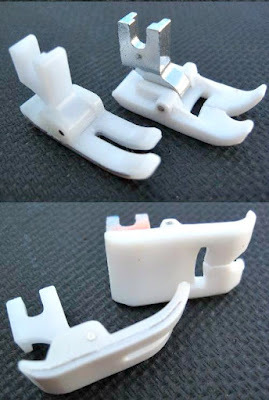 During my live Q&A sessions in my facebook group, the questions that pop up most regularly are about which sewing machine feet I use, so I thought I'd pop a little post together for you to refer to. There is a plethora of machine feet available, but I use surprisingly few...in fact, just a handful! The foot that stays on my machine 90% of the time is my Walking foot. This is sometimes called an even feed foot. 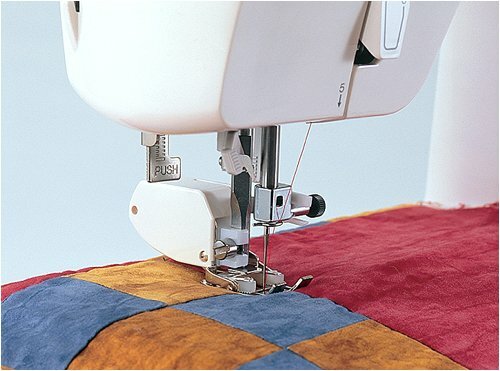 It's a bulky foot that you screw on to the machine, and it comes with an optional arm that can slot onto the bulky bit at the back as a guide, that bit is really useful for quilting, but as I don't quilt, that bit has been lost forever! The picture above shows the foot with the needle down, and the quilting bar attached. This second picture, the one above shows where the foot attaches to the machine shank on the left with the screw. You would need to remove your regular foot using that screw, then attach the walking foot it it's place. You can just see on the right that there's a hook which attaches to the screw holding the needle in. This keeps the foot moving with the needle. The walking foot helps to keep both the top and bottom layer moving evenly, so you don't get to the end of your seam and find that your layers are not even. It's great for sewing thick fabric, and I find that it is great for sewing faux leather, cork etc. It can be a bit noisy when you're sewing, a bit clunky, but I leave this foot on all the time, just to ensure that everything is going through the machine at the same rate. My machine has the needle position set to the left automatically, which would hit the foot, so I need to remember to set my needle to the centre before trying to sew with the walking foot. My second most used foot is the Adjustable zipper/piping foot. I quickly realised that no matter how much I concentrated, I could not sew a straight zip for love nor money with the zip foot that came as standard with my machine. With the adjustable zipper/piping foot I've yet to sew a (really) wonky one! 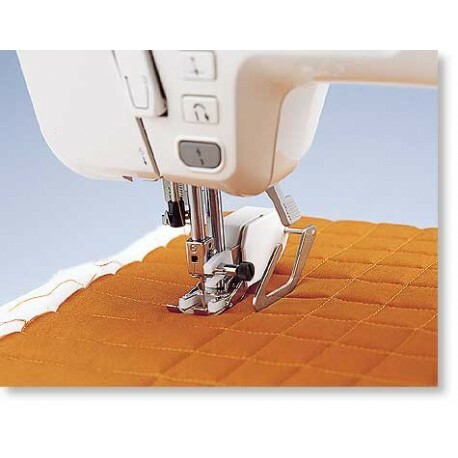 You can set your needle to either stitch into the cut out on the left, or the right of the foot depending on what you're sewing and your preference. 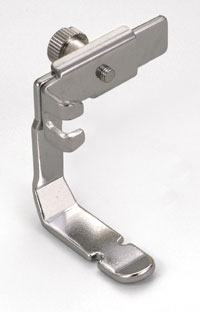 This foot also attaches to the foot shank on your machine using the screw on the left as shown in the Walking foot example. (screw not shown in this picture). To ensure I can get a really accurate sew, I attach the foot to my machine, then lower it, gradually lower the needle, and then adjust the foot (using the back screw) until the needle is in line with the edge of the foot, piercing the fabric through the groove on the side. When you sew, you can use the edge of the foot as a marker for where your line of stitching will appear. It just makes things so much easier and neater, and is well worth the investment if you find it tough to get neat zip pockets! Next up, and the only foot I would recommend you buy a proper branded one, is the Teflon foot. You can buy these specifically for your machine, either as snap on feet, or screw on machine. Cheap imitations will not work as well in this case. You'd use a Teflon foot for sewing faux leather or vinyl. The Teflon coating helps the foot to glide over the fabric instead of sticking and catching the fabric underneath. These are great if you want to move your bag making on by trying different materials, and faux leather and vinyl can give a really professional great finish! One last foot, and one that I don't use, but can be great if you are not overly confident in your top stitching, is the edge stitch foot, sometimes known as the stitch in the ditch foot. 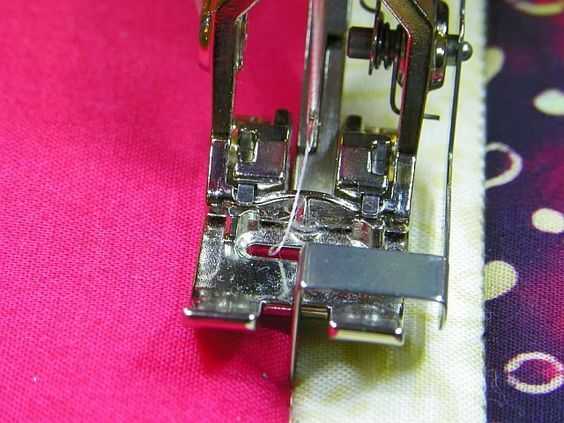 In the picture above you can see that there is a metal guide in the very centre of the foot, you can position this either in a seam (As above), or on the edge of the piece of fabric you wish to sew. For us bag makers, we would want to position the needle to the left, and then have the guide on the edge of the piece of fabric that we want to sew. This will ensure a consistent top stitching seam allowance around the entire top of the bag! None of these feet came as standard with my own domestic machine, but I have found that they are a valuable investment to make my bags more professional, and just generally make life easier! What machine foot would you recommend for bag making?